DollyCraft.com is an online store featuring doll related parts, outfits and accessories in very limited quantities. Many items offered come from my personal collection while other items will have been commissioned specifically for DollyCraft. Resin Tenner bodies are IN STOCK! The price is $260 (plus $15.00 shipping and insurance). Designed to provide a fully jointed body for child dolls whose faces you love, but do not have articulated knees, ankles, wrists, elbows and upper torsos that you want. 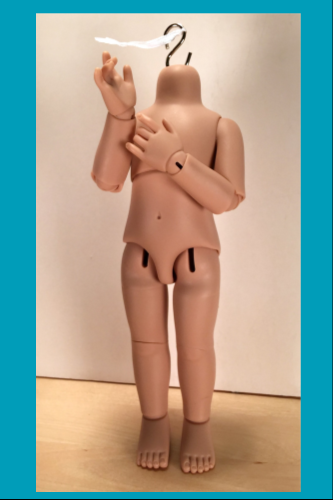 This fully strung headless body comes to you ready for attaching your favorite dolly head. The Tenner was created originally to fit the adorable 10" Ann Estelle dolls and all her friends produced by Tonner Dolls before 2006. The Tenner can also be the perfect articulated body for some porcelain heads sculpted by Dianna Effner. (Examples can be seen at The Life and Times of Ann Estelle). The price is $260 per body plus $15.00 shipping and insurance. To order more than one Tenner, edit your shopping cart and change the number of units ordered. Total of 5 available. Please let me know if you have any questions or would like to make special arrangements for payment.